A landmark year for Buick, 1931 saw it make the transition from straight-six to straight-eight power. The work of John Dolza and his team, the marque's new powerplants displaced 221 cu in (3.6 litres), 273 cu in (4.5 litres) and 344 cu in (5.6 litres) respectively. Among the most advanced engines of their day, the trio featured automatic spark advance, overhead valvegear, V-belt driven fans, updraft carburettors, five-bearing crankshafts and aluminium sumps. Notably smooth and powerful, they were allied to three-speed manual transmission with synchromesh as standard on all but the entry level cars. Overseen by Buick's chief engineer Ferdinand 'Dutch' Bower, the 1931 models sat on 114-inch (Series 50), 118-inch (Series 60), 124-inch (Series 80) and 132-inch (Series 90) wheelbases and could be had in Sedan, Coupe, Phaeton, Convertible, Roadster and Limousine guises. The new straight-eight proved its mettle at that year's Indianapolis 500 when Phil Shafer posted a 105.1mph qualifying lap and 86.4mph average speed aboard a Buick-powered Roadster. None of the '31 cars were slouches but the open-topped Series 90 variants were reputedly capable of 90mph; a speed which made the standard fitment of four-wheel drum brakes all the more welcome. Finished in silver over black with grey cloth upholstery, this particular left-hand drive example is described by the vendor as being in "excellent" condition with regard to its engine, interior trim, bodywork and paintwork, while, he rates the electrical equipment and three-speed manual gearbox as "good". Reportedly exhibited in a Texan museum for a number of years, the Buick is believed but not warranted to have had just three owners. 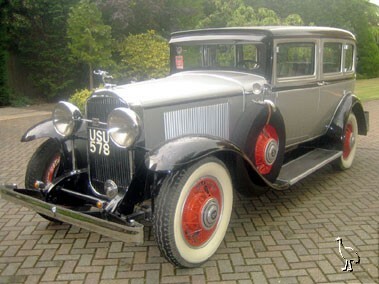 Said to have been restored from the 'ground up' by a UK-based American car specialist some eight years ago, this imposing Straight Eight Sedan is offered for sale with MOT certificate.